Occurrence: As fruit, juices, syrups, spirits, fruit shakes, fruit cocktails, mixed dried fruits, ice creams, yogurts and other dairy products, puddings, breakfast flakes, energy bars, flavouring powders or essences, confectionery, baked goods, and fruit sauces. Kiwi allergy occurs in adults and in children. Like many other allergies to fresh fruits and vegetables, kiwi allergy can take several different forms. In some it appears that their allergy is developed as a result of eating kiwi. In others allergy to kiwi is associated with allergies to pollen or latex. Thus people with birch-pollen allergy can develop kiwi allergy with symptoms comprising local reactions in the mouth and throat with itching and inflammation (called oral allergy syndrome, OAS). Others develop kiwi allergy because of the similarity between the allergens in kiwi and natural rubber latex (e.g. gloves, condoms, balloons) a condition known as the latex-fruit syndrome. Symptoms developed by these individuals comprise generalised urticaria, abdominal pain, vomiting and sometimes life-threatening symptoms. Some individuals can also develop adverse reactions to fig, avocado, banana, chestnut, melon, sesame seeds, poppy seeds, hazelnuts, and rye grain. Some varieties of kiwi (like gold kiwi marketed as Zespri Gold) contain less of the major allergen. However, people allergic to green kiwi can also react to this variety. The Kiwi fruit, also called Chinese gooseberry, is the fruit of a bush, native to China. New Zealand started growing the fruit for export in 1906 and named it after their national bird, the kiwi. It is now produced in New Zealand, Japan, Australia, Chile, USA, Italy, Greece and Spain. Kiwi belongs to the botanical family Actinidiaceae and its Latin name is Actinidia deliciosa. The fruit is often eaten as such and can be an ingredient in fruit salads and juices.SymptomsThe oral allergy syndrome (OAS) and urticaria (nettle-rash) are the most common manifestation of allergy against kiwi. OAS consists of itching of the mouth and throat, formation of small blisters in the oral mucosa, and irritation and swelling of lips, vocal cord and upper parts of the throat Other symptoms reported are indigestion, nausea and vomiting, wheeze and other respiratory symptoms, rash (urticaria) on skin contact as well as very severe allergic reactions, i.e. anaphylaxis. In a Swedish inquiry study, 83% of 161 kiwi allergic patients reported OAS, 18% skin symptom, 6% allergic symptoms from nose or eye, 4% asthmatic symptoms and 4% gastrointestinal symptoms. In another Swedish study the 361 kiwi allergic patients graded the severity of their symptoms as follows: slight symptoms 40%, moderate 32% and severe symptoms 28 %.Systemic reactions seem to be more common in non-pollen allergic patients than in pollen allergic ones, who more often get oral allergy syndrome.In extremely sensitive individuals very small amounts of kiwi allergen can induce symptoms. Thus anaphylaxis was induced by skin prick testing with kiwi in one patient and by a lover’s kiss in another case.Related foods (cross reactivity)Because of related (cross-reactive) allergens, some inhalant allergies will also influence the occurrence of food allergy to kiwi. In studies using skin tests, blood samples and other methods, cross reactions are found between kiwi and pollen from birch, timothy, mugwort and olive and between kiwi and latex (natural rubber). Many of these cross reactions are, however, of very limited clinical importance, i.e. allergic symptoms are not induced by kiwi, although the patient show positive test results with the fruit allergen. 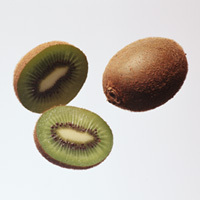 The most important cross reactions from a clinical point of view are those between kiwi and birch, and between kiwi and latex.There are also cross reactions between kiwi and several other fruits, such as fig, avocado, banana, chestnut, melon, sesame seeds, poppy seeds, hazelnuts, and rye grain. In many cases these cross reactions can be seen in blood samples, but lack clinical importance.Who, when, how long, and how often? The occurrence of kiwi allergy is increasing in some European countries in the last few decades. The explanation to the increase is probably an increased consumption of kiwi fruit. Kiwi allergy was ranked among the top-ten foods in recent studies from Sweden, Denmark, Estonia, Finland and The Canaries. In inquiry studies from Northern countries about 1/3 of 1139 food allergic patients reported kiwi allergy, with higher figures (45%) in Sweden and Denmark, and lower figures in Estonia, Lithuania and Russia (18%). Kiwi allergy was found in 4% of 163 asthmatic children in France. Kiwi allergy occurs in all ages but is more common in adults than in children. Risk factor for allergy against kiwi is the existence of birch pollen allergy or latex allergy. There are regional differences in the prevalence of kiwi allergy, probably mainly depending on differences in cross-reacting pollen allergies. The long-term development of kiwi allergy in the individual person has not been studies and it is not known if kiwi allergy can be outgrown.Diagnosis In most cases of kiwi allergy, the patient's history is sufficient for diagnosis. It is usually not necessary to perform diagnostic tests. An allergic sensitization against kiwi can be shown by skin testing, e.g. prick to prick testing with fresh fruit, as well as by blood test measuring IgE antibodies against kiwi. The tests have, however, low specificity, which means that many false positive test results are seen, i.e. positive test result in individuals tolerating kiwi. With kiwi, as well as with several other fruits, elimination diets that rely only on the results of allergy testing, can result in unnecessary restriction. If a reliable diagnosis is a necessity, a blinded food challenge should be performed.Avoidance Avoidance of kiwi is presently the only available treatment for patients with an allergy to the fruit. Persons at risk, i.e. birch pollen allergic patients and latex allergics, should be informed about the possibility of getting a food allergy, related to their inhalant allergy. They should not, however, be advised to omit kiwi, if they have not noted any adverse reactions to the fruit. Similar information could be given to individuals belonging to groups with increased risk for latex allergy: health personnel using latex gloves and patients to children with spina bifida. Regarding labelling rules it should be noted that kiwi is not included in Annex IIIa of the new EU labelling directive. Other Information: The IUIS allergen names such as Act c 1 actually refer to proteins purified from Actinidia deliciosa. Symptoms:Clinical history with regard to kiwi allergy revealed that 31 (72%) patients had experienced oral allergy syndrome (OAS) after consumption of kiwi fruit; 12 (28%) urticaria, angioedema, or both; 5 (12%) contact urticaria; 4 (9%) anaphylaxis; 2 (5%) abdominal cramps; and 1 (2%) rhinitis, conjunctivitis, and moderate dyspnea (Aleman et al. 2004) . Oral allergy syndrome (OAS) has been also demonstrated to varying extents. In one instance 100% of allergic patients (Pastorello et al 1996)  , in another 89% (Fahlbusch et al1998)  and in a third 19% has OAS (Möller et al 1997) . 22 patients with a history of allergic reactions to kiwi fruit and birch pollen allergy. Ten patients had severe generalized symptoms such as angioedema, pharyngeal swelling, and dyspnea; 12 patients had oropharyngeal pruritus (Gall et al. 1994) . Eight patients (Huertas et al. 1999) . Seven patients who had symptoms after the ingestion of kiwi (Gavrovic-Jankulovic et al. 2002) . Forty-three patients (31 female and 12 male patients) aged 5 to 54 years (median, 31.2 years) were enrolled in the study (Aleman et al. 2004) . All patients showed positive skin prick test (Voitenko et al. 1997) . The skin test with the fresh fruit was positive in all patients although the test was not performed in two patients because of the severity of the symptoms. The skin tests with kiwi rind extract were positive in one patient (Huertas et al. 1999) . The thaumatin-like allergen elicited positive skin prick test responses in 4 of 5 patients. The test was positive in 5 of 5 patients using a kiwi extract (Gavrovic-Jankulovic et al. 2002) . Kiwi extracts (Moller et al. 1998) ; (Moller et al. 1997) . Pieces of fresh fruit were homogenised in acetone at -40°C (cooling in dry ice), and the mixture stored overnight at -20°C. The precipitates were washed twice with acetone and once with acetone:diethylether (1:1, v:v, -20°C) , filtered and lyophilised. 1.5 gr of the obtained acetone powder was extracted with 30 mL of PBS (0.01M potassium phosphate and 0.15 M NaCl (pH 7.4)) for 60 min by ice cooling. The suspension was centrifuged for 60 minutes at 10,500g, and the supernatant was filtered. ELISA (Huertas et al. 1999) . ELISA and CAP (Aleman et al. 2004) . 9 patients divided in two groups based on skin prick test and open challenge results. Group 1 included 8 kiwi allergic and birch pollen allergic patients. Group 2 included 1 kiwi allergic patient without allergy to birch pollen (Voitenko et al. 1997) . 11 patients (Moller et al. 1998) . 8 patients (Huertas et al. 1999) . 7 patients who had symptoms after the ingestion of kiwi (Gavrovic-Jankulovic et al. 2002) . 43 patients (31 female and 12 male patients) aged 5 to 54 years (median, 31.2 years) were enrolled in the study (Aleman et al. 2004) . In the CAP system, five sera were positive: 4/8 from group 1 and 1/1 from group 2. In the RAST system four sera were positive: 3/8 from group 1 and 1/1 from group 2. Five patients in group 1 released histamine in a dose-dependent manner after stimulation with different concentrations of kiwi extracts (Voitenko et al. 1997) . Seven patients had specific IgE against kiwi, banana, avocado and latex. Four sera contained specific IgE against three extracts but not kiwi (Moller et al. 1998) . Specific IgE against fresh kiwi and kiwi rind was detected in 5 and 1 patients respectively (Huertas et al. 1999) . The test was positive in 4 of 6 patients (Gavrovic-Jankulovic et al. 2002) . Lucas et al. 2004  determined a sensitivity of 60% and a specificity of 83% in 45 subjects. One atopic control had a false positive response. SDS-PAGE was performed in a vertical slab gel apparatus with a 16% separating gel and a 5% stacking gel in a discontinuous buffer system under either reducing or non reducing conditions (Voitenko et al. 1997) . The allergen extracts were separated by sodium dodecylsulfate–polyacrylamide gel electrophoresis (SDS-PAGE) with a 5% stacking gel and a 13% separation gradient gel (Moller et al. 1998) . SDS-PAGE was performed under reducing conditions using polyacrylamide gradient gels (Fahlbusch et al. 1998) . The protein extracts were separated by SDS-PAGE with a 4% stacking gel and a 10% separation gradient gel under reducing conditions (Gavrovic-Jankulovic et al. 2002) . The sample was run in SDS-PAGE gel (2.67% C and 15% T acrylamide) under reducing conditions (Aleman et al. 2004) . Separated proteins were electroblotted to nitrocellulose paper (pore size 0.45 µm) by using a Trans-Blot Cell. The paper was first blocked in phosphate-buffered saline, pH 7.4, with 0.5% Tween-20 and then incubated in sera diluted 1:4. IgE binding was determined with iodine 125–labeled anti-human IgE antiserum followed by exposure on x-ray (Pastorello et al. 1996) . Separated proteins were electroblotted to nitrocellulose membranes (pore size 0.45 µm). The membrane was first blocked in phosphate-buffered saline, pH 7.4, with 0.5% Tween-20 and then incubated in sera diluted 1:5. IgE binding was determined with alkaline phosphatase-marked monoclonal anti-IgE. The reaction was developed with 4-nitroblue tetrazolium and 5-bromo-4-chloro-3-indolyl phosphate as substrate (Fahlbusch et al. 1998) . Separated bands were electrophoretically transferred to P-Immobilon membrane (polyvinylidene difluoride). The membrane was incubated overnight with individual sera from patients and with a pool of sera from patients with positive IgE levels, as evaluated by means of direct ELISA. Specific IgE binding was detected with peroxidase-conjugated monoclonal anti-human IgE diluted 1:100. The reaction was developed with tetramethylbenzidin (Aleman et al. 2004) . All 30 sera reacted with a band of about 30 kDa, and therefore it was identified as the major kiwi allergen. Eleven other components also bound IgE, but none of them could be considered a major allergen, that is, recognized by sera from at least half of these patients. 30% to 50% of the sera recognised components of 41, 38, 32, 28, 24, and 22 kDa which were considered to be allergens of intermediate importance. Less than 30% of the sera recognized other components of 64, 20, 17, 14, and 12 kDa which were considered to be minor allergens (Pastorello et al. 1996) . Patients reacted to 10-12 kDa and 20-25 kDa proteins being the most common allergens in kiwi extracts. Patients from group 2 reacted strongly with a protein of 30 kDa and weakly with a 18 kDa band (Voitenko et al. 1997) . The major allergens of 43 and 67 kDa were detected by 5 and 4 sera respectively (of 7 patients). 2 of these patients also reacted to a 22 kDa protein (Moller et al. 1998) . Eight of the nine sera reacted with the 30 kDa protein. IgE-binding proteins were seen at 23 kDa (five sera), 43 kDa and 80 kDa (four sera) and >80 kDa (two sera) (Fahlbusch et al. 1998) . A protein of 24 kDa was recognised as the most prominent band by all 7 sera. Additionally, actinidin (30 kDa) as well as bands of 27 and 25 kDa were also recognised although with different intensities (Gavrovic-Jankulovic et al. 2002) . A pool of sera recognized several bands in a molecular weight range between 12 to 70 kDa. The most frequent IgE-binding band was recognized by 13 (54%) individual sera of 24 patients with kiwi allergy corresponding to actinidin (Act c 1), the major kiwi allergen. Seven (29%) patients recognized the band of 24 kDa, corresponding to a thaumatin-like protein, and this should be considered as an important kiwi allergen. Eight percent of patients recognized the 12-kDa band, and 16% recognized the 66-kDa band. Nonetheless, among patients not allergic to kiwi, 8 (42%) recognized the actinidin band, 26% reacted to the thaumatin-like protein, 16% reacted to the 12-kDa band, and 10% reacted to the 66-kDa band (Aleman et al. 2004) . Patient had to chew a small piece of fresh kiwi (weighing about 2 g) for about 30 seconds and then spitting it out. If no symptoms occurred within a period of 15 minutes, the test was repeated with double the dose of kiwi. Then, until intense symptoms or signs of an OAS occurred, the challenge was repeated at 15-minute intervals with doubling doses to a maximum dose of 64 g. If the 32 g dose did not elicit a reaction, the patient was asked to swallow this dose, and the same procedure was followed with the final dose of kiwi (Pastorello et al. 1996) . Buccal challenge was performed by chewing 5 g of fresh kiwi for 30 seconds and then spitting out the fruit. A reaction was considered positive if itching or swelling occurred in the mouth or oropharynx within 15 min (Voitenko et al. 1997) . Two different drinks were prepared for the test meal, an active drink (with kiwi) and a placebo drink (without kiwi). Active drink (250 mL) consisted of 50 g fresh kiwi pulp, 10 g wheat semolina, 3.5 g vanilla and 150 mL, pineapple juice, and the placebo drink of 10 g wheat semolina, 3.5 g vanilla, 150 mL pineapple juice, 0.1 mL green liquid coloring, 0.15 mL yellow liquid coloring, 75 g pear pulp. (Aleman et al. 2004) . Pastorello et al. 1996  demonstrated IgE cross-reactivity between timothy, birch pollen and kiwi by immunoblotting inhibition. Similarly, IgE cross-reactivity with birch, rye, timothy, mugwort pollen and kiwi allergens was described by Rudeschko et al. 1998 . Further characterisation of IgE-binding antigens in kiwi with particular emphasis on glycoprotein allergens. Pastorello EA, Conti A, Pravettoni V, Farioli L, Rivolta F, Ansaloni R, Ispano M, Incorvaia C, Giuffrida MG, Ortolani C.
Identification of actinidin as the major allergen of kiwi fruit. Characterization of allergens in kiwi fruit and detection of cross-reactivities with allergens of birch pollen and related fruits. Huertas Amoros AJ, Mozota Bernad J, Ramon Puertas, J, Rodero Hernandez J.
Allergen properties & biological function:Cysteine protease named actinidin (EC-3.4.22.14) which has specificity similar to papain. Such proteases have a putative role in plant defense. The protein has 3 disulphide bonds, is not glycosylated as determined by lectin binding and periodic acid Schiff stain. X-Ray diffraction studies have been performed (Baker et al 1980; Varughese et al 1992)  . Although named as Act c 1 by the IUIS, the allergen was purified from Actinidia deliciosa. The protein showed antifungal activity toward Saccharomyces carlsbergensis, and Candida albicans. It belongs to pathogenesis-related protein group 5. Allergen purification:Peeled kiwi was homogenised in 100 mmol/L sodium bicarbonate buffer containing 2% (wt/vol) polyvinylpolypyrrolidone, pH 9.3 (1:2 wt/vol). After extraction (3 hours at 4°C), the slurry was centrifuged (15 minutes at 10,000 x g). Ammonium sulfate was dissolved in the extract (100 mL) to achieve 60% saturation. After overnight standing (4°C), the solution was centrifuged (15 minutes at 10,000 x g). The obtained pellet was dissolved in a minimal volume of the starting buffer and dialyzed extensively against the same buffer. The dialysate was spun and subjected to gel permeation chromatography on a Bio-Gel P-60 (Bio Rad) column (39 × 1.2 cm). Enriched protein fractions were pooled, concentrated twice, and subjected to ion-exchange chromatography on a QAE-Sephadex A-50 column (8 × 1 cm) pre-equilibrated with 100 mmol/L sodium bicarbonate buffer, pH 9.3. The unbound protein fractions were pooled, concentrated twice by means of ultrafiltration, and dialyzed against 150 mmol/L NaCl in 50 mmol/L sodium acetate buffer, pH 6.0, overnight. The protein sample was applied on a copper iminodiacetate Sepharose CL 4B (Cu2+-IDA-Sepharose) column (3.5 × 0.7 cm). Finally, the unbound protein sample was rechromatographed on a Superdex 75 prep grade (Pharmacia) column (30 × 1.2 cm). 2-dimensional PAGE showed 2 spots with the same molecular weight and isoelectric point (pI) of approximately 9.4 and 9.5. These 2 isoforms migrated as one protein band of 24 kDa. Thaumatin-like kiwi protein revealed a concanavalin A\Zbinding ability indicating that it may be glycosylated.